Australia’s drought continues to leave a toll on agriculture with irrigators the latest group to feel the effect. In a September report, valuers Herron Todd White warn that increasing water prices will affect growers of permanent crops and commodity prices. Water-intensive crops such as almonds, avocados, grapes and citrus fruits could face a price rise as the price of leased water heads north of $300/megalitre. “Returns remain good for most commodities which will justify the cost of leasing water, even though it will reduce profit,” said valuers Shane Noonan and Graeme Whyte. Pressure on the water market will reduce returns for wine-grape growers, but also those with high-value crops including almonds, citrus fruits and table grapes. 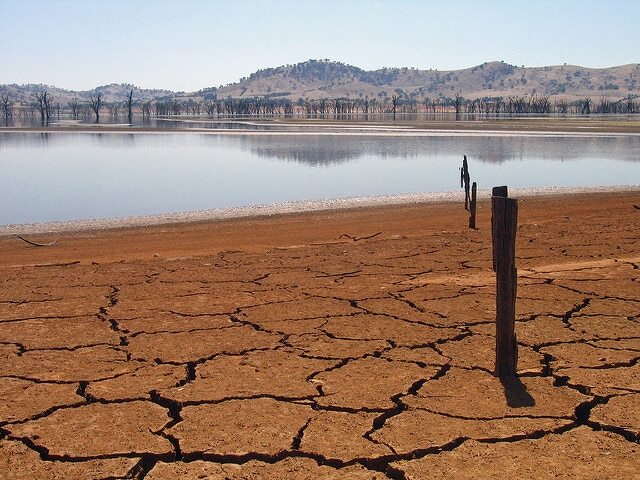 Water security concerns amongst irrigators, as well as Government water purchases, has forced the value of water rights increasing towards $5000 per megalitre. “Water prices are edging towards those last seen during the 2005-10 millennial drought,” said Matt Horne, water broker with Elders Deniliquin. Mr Horne said that the upward trend in water rights pricing is making properties with sufficient ground and surface water highly attractive. Water funds and investment companies have profited from market trends, earning increased performance fees on the back of surging water prices. Continued drought conditions have seen agribusiness giant Nufarm post a $15.6 million tax loss for the last financial year, on the back of a $114 million profit in 2016-17. Sales of Nufarm herbicides and pesticides are the major driver for the loss, as well as the cost of acquisitions for their European operations. “The major driver of the lower profit outcome was the drought here in Australia, with conditions in large and important growing regions in the eastern states being the driest on record for around 100 years,” said Nufarm chief executive Greg Hunt. “[Drought conditions] in large parts of eastern Australia have significantly impacted our overall financial performance, we have successfully grown our business in the other key regions and core crops, that we are targeting as part of our strategy,” he said. Nufarm’s international operations have experienced strong growth across North America, South America and Europe, with revenue up by 6.3% to $3.3billion. The outlook for this season continues to look grim as drought conditions take their toll on agricultural regions across the eastern states. New South Wales’ total crop is estimated to be half the size of last years and just 26% the size of the bumper crop grown in the 2010-2011 season (14.78 million tonnes). Yields are expected to drop by 38% in Queensland and 29% in Victoria, according to a report released by ABARES. Grain scarcity has been reflected in pricing, with milling wheat currently valued around $400 / tonne, compared with $240 / tonne a year ago. Sources: The Financial Review, Sydney Morning Herald, Sydney Morning Herald Image: Lake Hume at 4%, accessed under a CC2.0 license.